Having successfully arrived at the end of my Burnside project (which means, of course, that I am upgrading my existing Fifth Model and looking for a Fourth Model), I wanted to share a couple of tips with those shooters and skirmishers hoping to improve their pistol shooting or rework/rebuild a long arm this off season. My first tip involves using old pistol targets to build a patterning board for your blackpowder revolver. After I accumulate six targets with no punctures inside the 8-ring, I paste all six targets in a pattern like the one shown in Photo 1. Then, I hang the patterning target up at 25 yards, and proceed to shoot at least 30 times (5 complete cylinders), making sure to begin each chain with the same cylinder, and fire in succession at the same targets each time. The end result is a pretty good picture of what each cylinder is doing with that particular load. Shooting off-hand at 25 yards gives me the same results I'll get in competition, so I favor this type of research over using a mechanical press for pattern results. 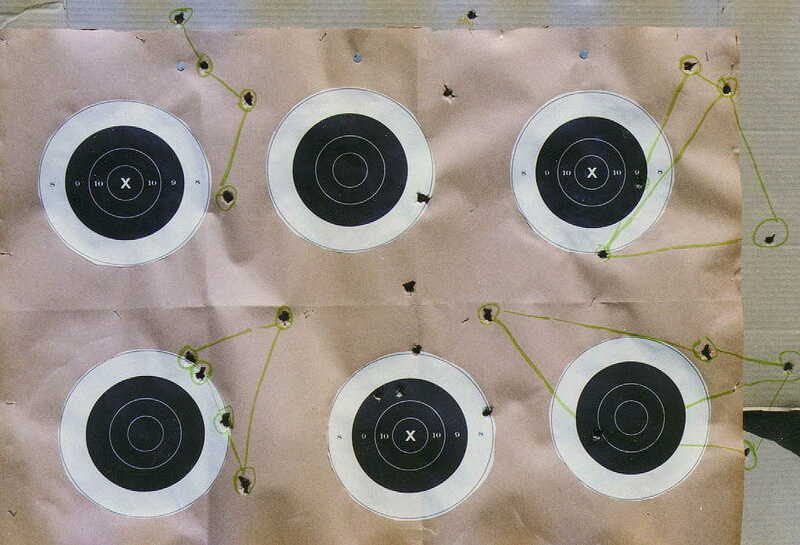 In Photo 2, below, you can see some results from a recent pistol pattern- ing practice. I can't say that I really know why I thought this load would work, but all six groups are high and/or to the right. Only the bottom middle target shows anything resembling success, and some cylinders didn't even put all five shots on the large backer. I guess you can see how I ended up with so many clean targets to use on the board! 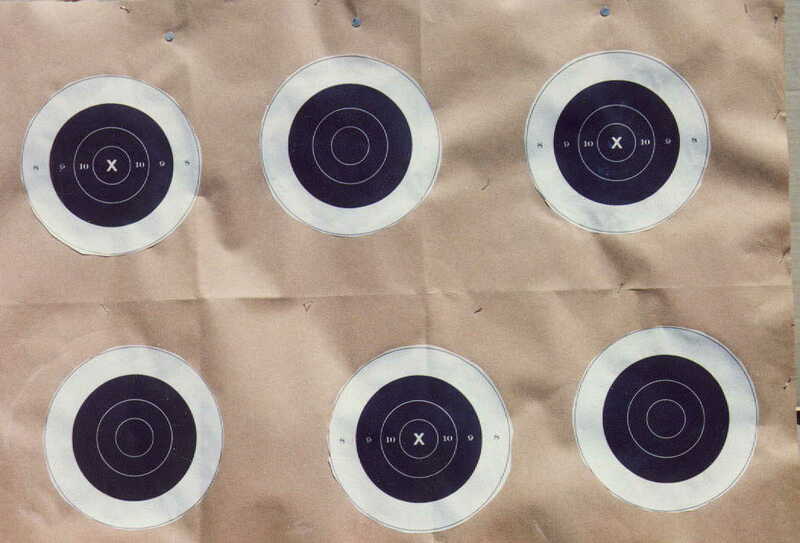 I think this type of patterning is useful, whether you are shooting individuals or team targets. First, patterning helps you develop a good load, and then proves that it works. Second, it identifies your best shooting chambers, if you are inclined to only shoot those chambers in individual competition. And third, it means more practice, and practice is only going to make you a better shooter. My second tip involves making a barrel soaker to help clean up old or dirty barrels. I first used the barrel soaker back in the late 60's and early 70's when I was taking old Mauser actions and making sporters out of them. Back then, we used iron pipe, but today you can pick up some plastic PVC that is lighter and easier to use then the old ferrous pipe. The barrel soaker shown in Photo 3 was used to help clean up the old Burnside actions I acquired. 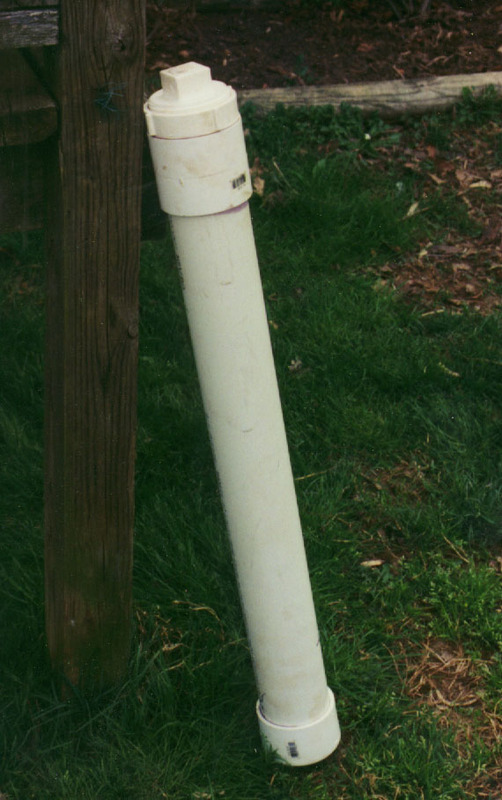 The barrel soaker shown is constructed of 3-inch PVC pipe, with a cap on one end and a threaded cleanout on the other. The cleanout seals tight, but allows access to the barrel in the pipe for cleaning, etc. I used scrap pieces for my soaker and only had to buy the cleanout, so the total cost was around five Yankee dollars. Even if you buy all your parts, I don't imagine it would cost over $15.00. The length of your soaker will depend on what you plan to soak. The idea behind the barrel soaker concept is to submerge the barrel in liquid to loosen the debris in the bore. It also helps loosen rust from exterior pits and gouges. My soaker is 36 inches long, allowing 2-band and Burnside barrels both to be treated. When the barrel is being soaked, about once a week, I take a bronze bore brush and sweep out the bore for about 5 minutes, then close the whole thing up and come back in another week. About once a month, after the usual brushing, I wipe off the whole works and pick at the rust for a bit. With patience, a barrel of questionable character can be cleaned and verified ready for use. Both of my Burnsides cleaned up very well, and I doubt I could have gotten either one at a reasonable price if the barrels were cleaned before I ac- quired them. My 36" x 3" soaker holds one gallon of WD-40(tm) combined with a quart of cutting oil, and this lightweight oil combination has worked well for me. I would recommend that you make sure your barrel is completely submerged while in the soaker, because exposed metal will still rust inside the pipe if subjected to the air. I hope you get a chance to use one or both of these tips this fall or winter, and that you have rewarding results as well. I missed my first National Skirmish in 12 years in order to spend the weekend celebrating my Grandmother Sistek's 100th Birthday with the family. I'll try to catch up with what I missed there by interro- gating the sutlers at Cedar Creek. I'll close by asking you to make sure you vote this year like your gunownership depended on it. I only know of one candidate with no military experience, in fact, this candidate left the country to avoid military service. Let's get back on the road to sensible gun ownership by clearing house -- the White House. Don't forget the local blackpowder shoots during this hiatus from Skirmishing. Aggitate for a musket class when you hear a shoot is coming up, and then get some friends and go shoot in the Musket Class. Clubs hold shoots to make money, and if you'll buy targets, they'll sell 'em. So, get out there and shoot safe and have fun.